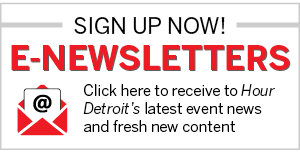 Throughout the years, Detroiters have loved fun and games. 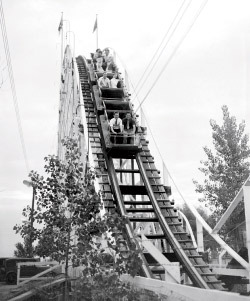 Amusement parks once were as popular as watermelon in July; among them were Electric Park on East Jefferson; Eastwood Park, in what is now Eastpointe; Bob-lo, on the Detroit River; Edgewater Park, on the west side of Detroit; and Jefferson Beach, along Lake St. Clair in St. Clair Shores, where this photo was taken of thrill-seekers on a white-knuckled roller-coaster ride. Jefferson Beach, off Jefferson between Nine and Ten Mile roads, opened in 1927 and was a big draw for more than 30 years. “There was a kiddie land, carousel, pavilion, rides, boating, swimming, and a roller coaster that was one of the largest in the country,” says Cynthia Bieniek, archivist and librarian at the St. Clair Shores Public Library. “There was also a ballroom with a floating dance floor, which was quite an attraction. During World War II, big bands played there,” she says. Indeed, an undated ad touted an appearance by the Joe Haymes Orchestra. Another unusual feature was an oval-shaped Ferris wheel called “The Swooper.” In 1955, a fire swept through the park, which started in the funhouse, Bieniek says. The park plied on, but its days were numbered. In 1959, Jefferson Beach closed and it was turned into a marina. Today, the area is known as Jefferson Beach Marina. Although the amusement park was razed, the dance hall was left standing. It was used as a storage facility, but it burned down in 1998, Bieniek says.